The sustainability crisis has provoked an unexpected and dramatic response from academia. Until now, higher education institutions have tended to focus on sustainability within their own borders. This has predominantly been via sustainability education, research and designing green or carbon neutral campuses. Yet borders between society and academia are dissolving. Many high-profile universities across the world are reaching out past campus boundaries to form ambitious partnerships with industry, government and civil society organisations. In this role of ‘co-creation’, a university attempts to materialise sustainable development by working with society, to create society. That is, it collaborates with diverse social actors to trigger and then drive the sustainable transformation of a specific region, city or community. To cite but a few examples of many, the University of Strathclyde is partnering with Glasgow City to make the region “one of Europe’s most sustainable cities within 10 years”. Another is how Novatlantis — the sustainability initiative of the Swiss federal institutes of technology and research — is teaming up with public and private partners to utilise the cities of Basel, Zurich and Geneva as test beds for innovative sustainability experiments. Across the Atlantic, Cornell University and Oberlin College are engaged in separate but ambitious alliances to revive and transform the stagnating economies of two former industrial boom towns into exportable models of green, post-fossil fuel prosperity. The university, as an institution, should know a thing or two about sustainability. After all, it boasts more than 1,000 years of history, having endured wars, revolutions and dramatic transitions at the core of Western society. Today it stands at the pinnacle of its evolution as a highly complex, dynamic institution at the heart of the knowledge economy. The cutting edge knowledge originating from this institution — now operating across national borders and linking vast areas of science, industry, government and civil society — is responsible for everything from Gatorade to Google, and from superconductors to stem cell research. Despite this, the university has not often sought to spur great social transformations. Instead, it has typically been a conservative, monastery-like institution, aloof to the problems of the world and committed to maintaining ideals of the past. As argued by Mark Taylor of Columbia University, the university of today still stubbornly clings to an out-dated ‘separation of labour’ model, in which incompatible, separate academic disciplines, inhibit a holistic response to the problems of the world. Competition between departments reigns at the price of cooperation and cross-disciplinary research. Further, as an institution striving for universal truth, irrespective of time and place, the university has harboured a nonchalance towards place-based problem solving and research attempting to provide concrete solutions to local community issues. Co-creation: a new trend in academia? To label the academic function of co-creation as completely new is not entirely accurate. After all, historical examples of universities collaborating with external partners to tackle real-world problems and utilise the local environs as a ‘living laboratory’ can be traced back to the land-grant institutions established since 1862 in the United States. More recently, a similar role to co-creation may be observed in university-city efforts, such as those by the University of Pennsylvania, to address neighbourhood deterioration and economic decay. Yet none of these prior functions seem to capture the ambition, scale and objectives of the cross-sector partnerships for advancing urban sustainability collated into Table 1 below. In assuming this unprecedented role of sustainability fomenter, the university is deviating from the dominant model of an ‘entrepreneurial university’ where the notion of contributing to society has become synonymous with contributing to the economy via technology transfer and commercialisation of research results. Instead, it is adopting a grander and far more concrete function — that of responding to the sustainability crisis and driving the transition to more resilient and environmentally sustainable towns and cities. Novatlantis and the Swiss Federal Institute of Technology (ETH) are the veterans of co-creation for fostering sustainable urban transformation. Guided by the vision of a 2000 Watt Society, a blue-print for a low-carbon Switzerland conceived by ETH in 1998, numerous public-private alliances have been formed in the fields of mobility, construction and urban planning. After an initial focus on the Basel-Stadt region, the Novatlantis-triggered race to de-carbonisation has spread to Geneva and Zurich. These three cities are now all competing to showcase and diffuse the various elements required to accelerate the sustainable transformation of urban Switzerland. The “hy.muve” (which stands for “hydrogen-driven municipal vehicle”) will keep Basel’s streets clean in more ways than one. Photo: ©Empa – Materials and Science Technology. Ten years of co-creation is at last bearing fruit. Basel has established itself as a centre of innovation in the field of individual, sustainable mobility. Since 2002, the Experience Space Mobility project has engaged automobile manufacturers, transport operators and key stakeholders to develop and demonstrate solutions for the short-term (natural gas), mid-term (biogas) and long-term (hydrogen fuel cells). A recent outcome here are trials of hydrogen powered municipal street sweepers. To promote sustainable construction, Novatlantis organises and supervises large-scale urban development projects that are required to integrate MINERGIE energy performance standards and adhere to principles outlined for the 2000 Watt Society. 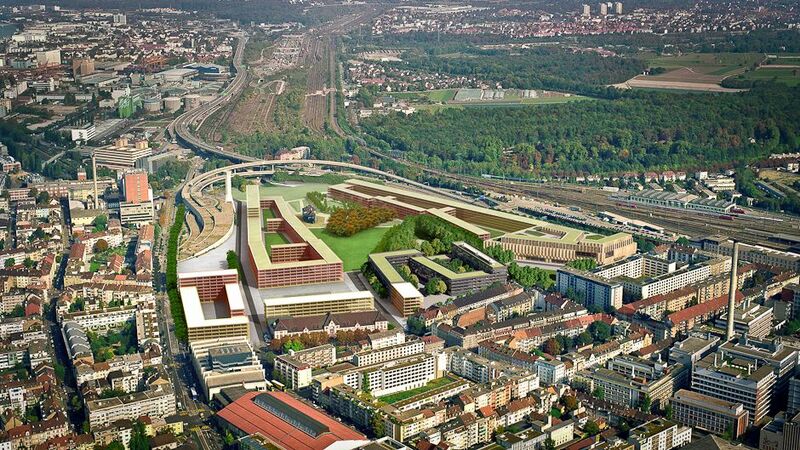 Again in Basel, projects of interest include the recently completed Gundeldinger Feld, where a former industrial site was converted into a fashionable commercial and cultural district, and the ongoing re-development of Erlenmatt, a former railway freight yard, into a mixed-use district containing commercial and residential buildings, shopping facilities, restaurants, schools and parklands. Another collaboration worth watching is the Oberlin Project, unfolding in the tiny ‘rust town’ of Oberlin, Ohio. Scattered across the northwestern states of the US, many towns such as Oberlin have lost their former economic glory and are struggling for survival with the decline of localised, heavy industries. Against this backdrop, Oberlin College and David Orr (one of the forefathers of the academic sustainability movement) are leading an ambitious partnership with the municipality, private enterprises, investors and local citizens to leap from ‘rust’ and despair to a model of post-fossil fuel prosperity, resiliency and sustainability. The project aims to make the City of Oberlin and its college carbon positive (i.e., not only carbon neutral, but actually absorb more carbon than it emits) and a self-generator of resources by 2050. Conceived as a “full-spectrum sustainability” response to the looming dual crises of climate change and peak oil, the project is cutting emissions through radical improvements in energy efficiency, converting the city’s entire energy supply to renewables (bio-gas and solar), transforming run-down city blocks to green building zones for the arts and sustainable business, and creating a 20,000 acre forestry and agriculture belt for food, timber and carbon-sequestration. Resiliency will be boosted by kick-starting local consumption and a green economy, and directing sustainable farm produce to local restaurants and hotels in the city. Residents and students will be engaged in this real-world sustainability experiment via educational alliances between the local schools and colleges, and lastly, a national network will be set up to export this transformational model to other regions. To achieve this, initial design and construction estimates have been put at US$140 million, with US$55 million just for the first phase — colossal figures for lean times in a small rust town. Even still, things are moving fast. The project has been nominated as one of 16 cities for the Clinton Foundation’s Climate Positive Development Program, and is attracting the interest of various military, national security experts and think-tanks such as the New America Foundation. Oberlin College’s focus for 2012 is on the construction of a 13-acre ‘Green Arts Block’ featuring platinum level Leadership in Energy and Environmental Design (LEED) certified buildings such an auditorium, theatre, student housing, hotel, restaurants and a business district. As for other project areas and the ultimate objective of becoming a prosperous, self-sufficient and carbon positive town, this will occur in a decentralised fashion over many long years, and possibly even decades. The chronic ailments of modernity are ‘wicked’, or ‘messy’, to borrow sustainability jargon. The unsustainability of our energy, transport, agricultural and economic systems all have their roots in multiple areas of the complex social, economic, technological, political and cultural fabric surrounding us. In forming partnerships such as those above, universities are now recognising that the only viable pathway to sustainability is one simultaneously addressing all these causes and mobilising all the required institutions, knowledge and resources into one comprehensive framework. That is where the true significance of co-creation for sustainability lies. This is precisely why innovation-driven, cross-sector partnerships for sustainability transitions are also a topic of high relevance to the related cross-cutting work at the United Nations University, such as the Sustainable Urban Futures initiative of the Institute for Advanced Studies. With an interactive network of academic institutions, local and national government partners and international organizations, UNU aims to serve as a platform for global and local dialogue and creative new sustainability ideas, while also contributing to capacity development efforts, particularly in developing countries. However, if more universities and faculty are to be encouraged to engage in alliances for urban sustainability transitions, several barriers need to be overcome. These include difficulties accessing funding, faculty time restraints, internal communication challenges amongst vast networks of partners and stakeholders, as well as institutional resistance from within academia. The reality is that most universities are yet to provide genuine incentives for the promotion of inter and multi-disciplinary collaboration and place-based action research for advancing urban sustainability. Yet the alliances formed by the Novatlantis 2000 Watt Society and Oberlin Project are demonstrating that these barriers are not insurmountable. With scores of other university-driven collaborations for sustainable urban transformations simultaneously unfolding across the globe, and many long years required for their completion, it appears that the emergence of the academic function of co-creation for sustainability has only just begun. Being a new development also means that there are very few, if any, successfully completed past examples from which to learn. Although it will be exciting to keep an eye on the progress made by the ambitious collaborations presented in this article, it remains to be seen whether they can actually realise their ultimate objectives. Nevertheless, our prediction is a hopeful one — that the university’s role of co-creation will continue to evolve and eventually become a key component of the urban shift to sustainability across the globe. Universities Co-creating Urban Sustainability by Gregory Trencher and Masaru Yarime is licensed under a Creative Commons Attribution-NonCommercial-ShareAlike 3.0 Unported License. Masaru Yarime is a Project Associate Professor of Science, Technology, and Innovation Governance in the Graduate School of Public Policy at The University of Tokyo. He holds a B.E. in Chemical Engineering from the University of Tokyo, M.Sc. in Chemical Engineering from California Institute of Technology and a Ph.D. in Economics and Policy Studies of Technological Change from the University of Maastricht in the Netherlands. His interests are corporate strategy, public policy, institutional design for sustainability innovation. Gregory Trencher was previously an intern for the Education for Sustainable Development Programme at UNU Institute of Advanced Studies in Yokohama, Japan. He is currently researching the potential of research universities to address the climate and sustainability crisis as part of a Ph.D. at the Graduate Programme in Sustainability Science at the University of Tokyo. He is also director of the Environmental Learning Institute, a climate change educational initiative for Japanese businesses and corporations. Oh, thank you, so, so, so much, this gives me much needed hope and a path, for me and others. It’s great to see this array of initiatives. I encourage interested people to check out what is being done at the University of British Columbia (UBC) in Vancouver, BC, Canada. John Robinson has led academic, research, and teaching initiatives that are remarkable. A new building, the Centre for Interactive Research on Sustainability, aims to demonstrate “regenerative sustainability”. Thanks to you both for your comments. I am pleased to see that there are more exciting initiatives out there such as CIRS at UBC. I was not aware of this effort so thanks for sharing that with me. I also invite you both, or anyone at all, to inform me of any other partnerships such as those I have presented in this article, that we may not be aware of.